In the film “Selma” David Oylowo jumps ahead of the pack of actors definitely in the race for a Best Actor Oscar nomination. Though this is not a biography of Martin Luther King, the role he plays, it does show the man with all his strengths and many of his weaknesses. King did not plan or organize the marches the film centers on but took the lead when they happened. 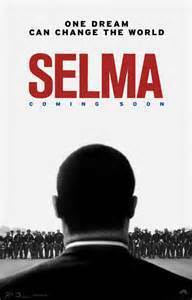 The film centers around 3 marches that took place in Alabama to protest the discriminatory practices that took place to stop black people from going to the polls though they did have the right to vote. The 54 mile march was to go from the town of Selma to Montgomery, the capitol of Alabama, to confront the Governor, George Wallace, played by Tim Roth. The facts of the marches were recorded and though they are the center of the film the screenplay by Paul Webb concentrates of real human beings, famous or not, who were involved. Those who lived through those violent and history making days will have their memories refreshed of what did happen and along the way learn things that took place unbeknown to them. There are some concerns about how the film portrays President Lyndon B. Johnson, played by Tom Wilkinson, showing him in private talks with Dr. King and between the President and Governor Wallace. This is a Hollywood story and there are no witnesses to the discussions that took place so depending on your thoughts you may feel one way or the other but by turning the light on individuals this becomes many personal stories. The 3 protest marches took place in March, 1967. The first ended when the State troopers and county policeman attacked the 500 marchers with billy clubs and using tear gas. A picture of Amelia Boynton, played by Lorraine Toussaint, beaten unconscious and laying on the ground, was shown all over the world with other pictures of violence, which had also been televised, with that day becoming known as ‘bloody Sunday’. You may not know or remember what took place at the other 2 marches but you will see that in the film. By its nature “Selma” is a violent film, though none of the scenes are gratuitous, and shows just enough to make a point without turning the audience off. One of the minor faults of the film is that except for the violence that took place there is very little heft in the drama that took place away from the marches which may have been what the director wanted. The acting, minor and major roles, is of the first order whether it be Carmen Ejogo as Coretta Scott King, Andre Holland as Andrew Young, Dylan Baker as J. Edgar Hoover, Stephen Root as Al Lingo along with Trai Byers, Stephan James, Cuban Gooding, Jr., just to mention a few. Oprah Winfrey as Annie Lee Cooper blends in as one of the crowd and, like them, is her character and not star. Though this film belongs to David Oyelowo, the director Ava DuVernay owns every shot, showing what needs to be shown without overdoing it. The scenes of the dyed in the wool racism shown by Wallace, local police, white citizens of Alabama are true to life and not ‘stacked’ in anyone’s favor. There is talk that she may become the first black female director nominated for an Oscar and it is certainly worth that recognition. “Selma” can be seen as a ‘history lesson’ but it is more of a reminder of America’s past and also can be related to America’s present.